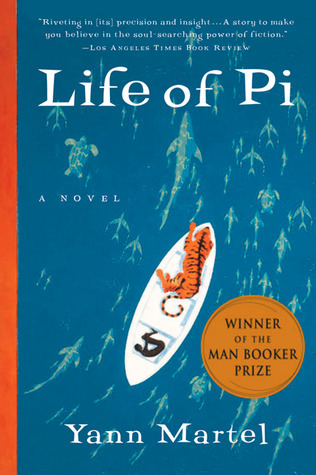 Life of Pi is the story of a young Indian boy named Piscine Molitor Patel — who goes by Pi to avoid vulgar bastardizations of his given name — who travels with his family to Canada on a Japanese cargo ship called the Tsimtsum. With them is their collection of zoo animals, bound for North American zoos. The ship sinks inexplicably, killing everyone on board except for Pi, a zebra, a hyena, an orangutan and a Royal Bengal tiger named Richard Parker, who are all confined to a small lifeboat. The hyena kills the zebra and orangutan, and is then killed by Richard Parker. Pi then has to provide them both with food, clean water and shelter from the elements, using his extensive knowledge of animals to stay alive. When Pi arrives in Mexico after months of being lost at sea, he is questioned by Japanese maritime officials who want to know how the Tsimtsum sank. As Pi recounts his 227 day voyage, the officials ask him how he could have possibly survived for so long. Realizing they don’t believe him, he gives them a different story — one without animals — that they accept more readily than the truth. I really enjoyed this book. It was wonderfully written — the language was beautiful, and Pi’s descriptions were vivid and engaging. The story is funny, horrifying, heartbreaking, and thought-provoking all at once. When Pi, who was born Hindu, starts exploring Christianity and Islam in an effort to understand God, I could relate as I went through a similar phase in high school. When asked to choose between being Hindu, Christian, or Muslim, Pi says that he “just wants to love God” and doesn’t understand why he can’t be all three. If only more people thought like that! As I was reading this book, I felt like I was on that lifeboat with Pi and Richard Parker. I felt his horror at discovering the carnivorous algae island, his fear when he first realizes Richard Parker is on the lifeboat with him. I felt his relief when he reached Mexico after spending almost a year in the middle of the Pacific Ocean. There are few books I’ve read that I’ve felt so connected to a character, and this was one of them. I’m still thinking about the story days later, even though I’ve already started reading another book. That doesn’t happen often, and it takes a brilliant author to really get inside my head and make me care about the protagonist’s wellbeing. Life of Pi has definitely earned a place among my favorite books. Tagged christianity, hinduism, islam, life of pi, religion, spirituality, yann martel.